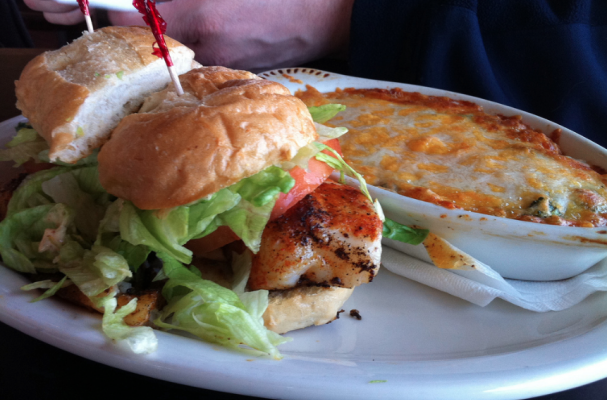 Whether you observe Lent or not, this mouthwatering blackened fish sandwich should be on everyone's dinner table this Friday. Not only is this sandwich delicious but it comes together in a flash. Fish cooks quickly in general but with this method, the filets are done in under 3 minutes! The spiced fish is paired with lettuce, tomato, and a homemade tartar sauce in a soft potato bun. Step 1: In a small bowl, add the chili powder, brown sugar, salt, cumin, and cayenne pepper and mix until the seasoning are incorporated. Season the fish filets generously with the spice rub. Step 2: Heat vegetable oil in a non-stick skillet over medium high heat. When the oil is hot, carefully lay the filets into the pan. Cook the fish until it is just beginning to turn opaque and slightly charred, about a minute. Turn the fish over and cook the other side for approximately another minute. Remove from heat and allow to rest on a plate for a few minutes. Step 3: In another bowl, whisk together mayonnaise, sour cream, pickles and lemon juice. Season the mixture with salt and pepper. Step 4: Assemble the sandwiches. Slather tartar sauce on both sides of the bun and stack the blackened filet, lettuce and tomato. Serve with oven fries.